IOM’s work on Disaster Risk Reduction (DRR) and environmental degradation contributes to the efforts of Member States to implement the Sendai Framework for Disaster Risk Reduction (DRR) 2015-2030 by advancing mobility-based strategies in disaster risk reduction and resilience. Paying particular attention to at-risk communities, migrants and other vulnerable mobile populations, this area of programming seeks to i) reduce disaster-induced displacement by harnessing the dimensions of mobility in prevention and preparedness; ii) mitigate the impacts of displacement through risk-informed response; iii) strengthen resilience by building back better in recovery and reconstruction; and iv) expand and strengthen partnerships to support integration of mobility dimensions in global risk reduction efforts. Specific activities include hazard mapping, multi-hazard risk assessments, community-based disaster risk management, planned relocation, resilient livelihoods development, early warning systems, DRR policy and strategy, disaster preparedness and hazard-informed emergency response. Activities will also include support to “build back better” goals in recovery and reconstruction through integration of DRR measures into the restoration of physical infrastructure and societal systems, and into the revitalization of livelihoods, economies and the environment. An average of 25.4 million people per year were displaced by disasters triggered by natural hazards between 2008-2015. The impacts of such hazards are increasingly magnified by climate and environmental change, fast-paced urbanization, and population growth. Among the direct human and economic costs borne by affected communities, disasters frequently result in large-scale population movements within and across borders which can reduce access to essential services and livelihood options, and increase exposure to violence, poverty and insecurity for both displaced populations and host communities. Disasters and environmental degradation also threaten to hamper progress towards the Sustainable Development Goals (SDGs), especially for those countries left furthest behind. As environmental degradation and climate change are expected to increase the frequency and intensity of sudden-onset hazards, and to worsen the impacts of slow-onset hazards, the implications with respect to human mobility will be significant. In support of its global mandate on human mobility, IOM maintains a commitment to supporting its Member States to implement the priorities set out in the Sendai Framework for Disaster Risk Reduction 2015-2030. 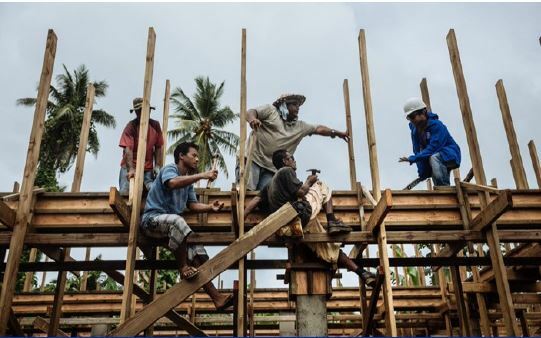 Fundamental to IOM’s approach is the inherent value that human mobility can bring to strengthening the abilities of individuals, societies and States to prevent, prepare for, respond to and recover from, the impacts of disaster. While recognizing the risks of unmanaged and unplanned mobility, IOM supports well-prepared and orderly movement of individuals away from hazards to protect lives and assets, improve access to assistance and livelihood opportunities, and facilitate a swift return to normalcy as conditions allow. Given the intrinsic links between mobility, risk and resilience, as the global lead agency on migration, IOM brings a unique perspective to global risk reduction efforts by situating mobility at the centre of its operational strategy to reduce risk and build resilience. On the occasion of the 2017 Global Platform on Disaster Risk Reduction, IOM has launched a Strategic Work Plan on Disaster Risk Reduction to assess and review its institutional work on DRR against the specific targets set out in the UN Plan of Action on Disaster Risk Reduction for Resilience. Reflecting the priorities of the Sendai Framework for Disaster Risk Reduction 2015-2030, IOM foresees intensifying support for the implementation of a range of activities organized under five thematic pillars of work, namely: i) disaster prevention; ii) disaster preparedness; iii) risk-informed response; iv) building back better in recovery and reconstruction; and v) partnerships for resilience. Beneficiaries also include Member States represented by various government entities at national, sub-national and local levels, as well as local and international non-governmental partners and other key stakeholders. Global partnerships are essential to reducing risk. IOM works closely with the UN International Strategy on Disaster Reduction (UNISDR) and agency partners to advance the global risk reduction agenda and is a member of the UN Senior Leadership Group on Disaster Risk Reduction. IOM is an active participant of subsidiary bodies of the Inter-Agency Standing Committee (IASC) relevant to risk and resilience, and recently acquired observer status in the Capacity for Disaster Reduction Initiative (CADRI). In the framework of government-led, multi-stakeholder partnerships, such as the Migrants in Countries in Crisis (MICIC) Initiative and the Platform on Disaster Displacement (PDD), IOM supports the inclusion of migrants and displaced persons in disaster risk reduction efforts, taking into account the specific vulnerabilities that these groups face and the fact that they are too often unaccounted for when disaster strikes. The government of the Federated States of Micronesia (FSM) developed a nationwide Disaster Risk Management and Climate Change Policy in June 2013. IOM supported the FSM Office of Environment and Emergency Management (OEEM) to successfully mainstream environmental migration in the text of the policy document. The FSM now recognises “the rights of island communities to their ancestral lands, while also acknowledging the role that migration has played, and will continue to play, as an adaptation strategy to a changing environment.” The policy sets out provisions to prevent forced migration resulting from environmental degradation through adaptation strategies, and at the same time acknowledges the role of well managed migration as a possible positive response to environmental change. West Africa increasingly suffers from hydro-meteorological and climate-related hazards. These hazards are exacerbated by a range of factors, including weak environmental controls, poor land use and rapid urbanization. Local and national governments are frequently called upon to manage the mobility impacts of a disaster, however, responses are imperiled by weak data collection and analysis capacities that are vitally important for generating actionable data to inform response and recovery interventions. Focusing on countries within the Economic Community of West African States (ECOWAS), IOM is implementing a project to train officials on population mobility tracking, data collection methodology and data protection principles based on IOM’s global displacement tracking methodology, DTM. The project is providing a vital contribution to increasing the preparedness capacities of States to respond more effectively to the mobility dimensions of a disaster in line with international standards and principles. In July 2010, flash-flooding in Pakistan wreaked havoc in 15 thousand villages, affecting some 18 million people. IOM responded through the ‘One Room Shelter Project’ to provide 30,000 flood resistant durable shelters. A key feature of the project was to empower people to lead their own reconstruction process through a system of conditional cash payments. The project made use of locally salvageable materials, local labour and locally purchased material inputs. Key to the ‘build back better’ approach was support to training in flood-resilient building methods stressing adoption of local designs. IOM also supported a national communications initiative that raised awareness of assistance entitlements, disseminated key risk information and promoted a humanitarian hotline. The communications project led by IOM was subsequently incorporated into the Governments national disaster risk management strategy in recognition of its important contribution to the strengthening resilience in recovery and reconstruction. For the most commonly used definition of ‘internally displaced person’, refer to ‘Guiding Principles on Internal Displacement’, Office for the Coordination of Humanitarian Affairs, United Nations, 2004. For a discussion on ‘cross-border disaster displacement’, refer to ‘Agenda for the Protection of Cross-Border Displaced Persons in the Context of Disaster and Climate Change’, The Nansen Initiative, 2015. For more information on situations in which migrants are present in a country experiencing natural disaster see ‘Guidelines to Protect Migrants in Countries Experiencing Conflict or Natural Disaster’, MICIC Initiative, 2016. Jointly produced by PDD, IOM, UNHCR, IDMC, and NRC. Download policy brief here.